John Olsen handmade etching titled Dancing Frog 2017 has now been made and hand signed, this edition of Dancing Frog 2017 is limited to 20 prints only, the etching is a fine art limited edition hard ground line etching print, Dancing Frog 2017 line etching by Australian artist John Olsen has an image size of 12.3×17 cm and is the same size as Dancing Frog 2017. Dancing Frog 2017 by Australian artist John Olsen the latest handmade fine art hard ground line etching, this limited edition of Dancing Frog is made on 270 gsm Reeves BKF full fine art rag paper, a favourite archival paper of John Olsen and Max Miller. 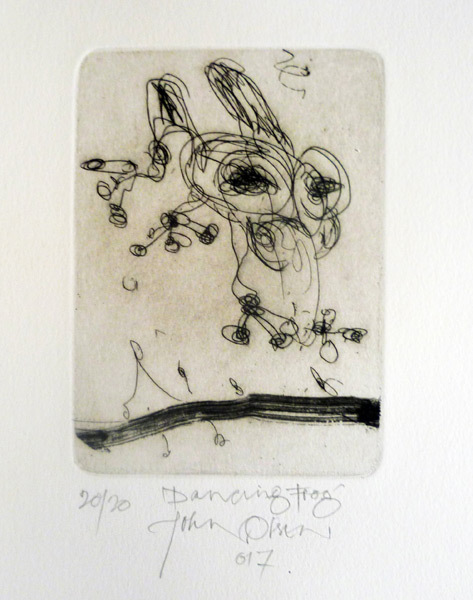 Australian artist John Olsen hand signed Dancing Frog 2017 etching print is available at Etching House.